In 1530, Sir Thomas More, the Lord Chancellor of England and prominent writer and philosopher, refused to attach his name to a letter signed by numerous nobles and churchmen to Pope Clement VII defending British King Henry VIII’s decision to annul his marriage to Catherine of Aragon and marry Anne Boleyn in hopes pf producing a male heir to his throne. Shortly afterwards, turned down by the Pope, a furious Henry VIII bolted from the Catholic Church and started his own church, the Church of England. More, and everybody else, was again asked to back Henry’s decision to annul his wife and to also sign a “loyalty” oath to the King. More refused. 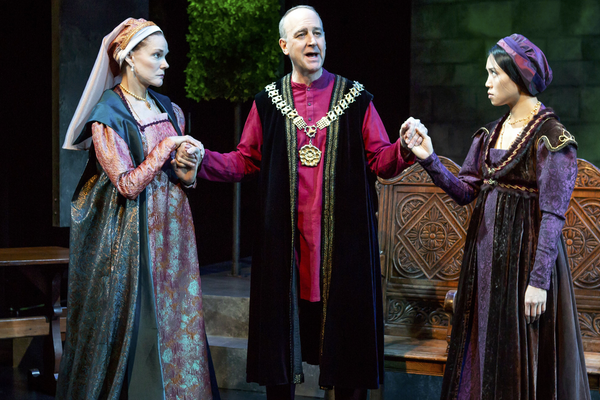 That refusal, and the war between the Chancellor and Henry VIII, is the basis for Robert Bolt’s brilliant and award-winning play A Man for All Seasons, now getting a splendid revival at the Acorn Theater in Theater Row, W. 42d Street, New York. The play, first produced in 1960, was the foundation for the box office hit movie of the same name in 1966. The film starred Paul Scofield and won six Oscars, including Best Picture. Scofield won the Best Actor award. The play has had several revivals since then and this is one of the best. This play about 16th century British history succeeds because of the vivid story, a solid script, a moral issue, sharp direction by Christa Scott-Reed and exceptional acting by a gifted ensemble of thespians. Bolt’s play starts out with a general question of whether or not More should give in because, after all, everybody else in the realm gave in. Why should he hold out all by himself? Then it gets tense when More refuses to knuckle under and explains that religiously, the King, and the people, owe their allegiance to the Pope, a figure of controversy himself, and church and that a person, no matter how powerful, just can’t leave the church, get rid of his wife and take up with a new woman. He also argues that his conscience forbids it. Then Bolt tightens the story even further and More withstands a smear campaign, full of lies, trumped up charges, a year in prison and turmoil in his family. Added to all of that is More’s knowledge that if he somehow prevails and keeps the King from splitting from his wife, Henry might not have a male heir and a civil war might break out in England upon his death. The King, and his aides, give More every chance to escape a death penalty and you, in the audience, are screaming inside to make him take the way out being offered – please – and earn freedom from orison and keep his head. Thomas More was canonized as a saint by the Catholic Church in 1935. What makes the play so enjoyable is the work of the actors. Michael Countryman plays Sir Thomas and he gives a powerful performance. His strength is that he, as More, does not weaken as the pressure is put on him; he gets stronger. By the end of the play, battling for his conscience, he is just as strong as Henry VIII, one of England’s most powerful monarchs. Trent Dawson is a blazing comet in his short appearance as the King, dressed splendidly. Henry Bouvy is the “common” man who plays several different small roles and tries to connect the audience, all of us common men and women, to the story. Other fine performances are by David McElwee as Richard Rich, Kevyn Morrow as the Duke of Norfolk, Carolyn McCormick as More’s wife. The best performance in the play is by Todd Cerveris as the slippery, duplicitous, scheming, lying, arm twister Thomas Cromwell, the King’s secretary and head henchman. He is the perfect royal gangster. In the end, does Sir Thomas yield or doesn’t he? How much is a righteous stand on an issue worth? Your life? At the end of the play, after a loud round of applause, every single person in the theater says to himself/herself, what if it was me? What would I have done? PRODUCTION: The play is produced by the Fellowship for Performing Arts. Scenic Design: Steven C. emp. Costumes: Theresa Squire, Lighting: Aaron Porter, Sound: John Gromada. The play is directed by Christa Scott-Reed. It runs through February 24.